How to watch The Hunchback of Notre Dame (1996) on Netflix Netherlands! Sorry, The Hunchback of Notre Dame is not available on Dutch Netflix, but you can unlock it right now in the Netherlands and start watching! With a few simple steps you can change your Netflix region to a country like Egypt and start watching Egyptian Netflix, which includes The Hunchback of Notre Dame. We'll keep checking Netflix Netherlands for The Hunchback of Notre Dame, and this page will be updated with any changes. 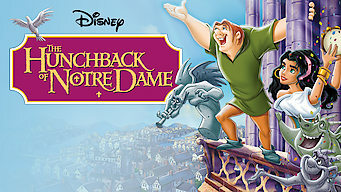 The Hunchback of Notre Dame is not available in Netherlands BUT it can be unlocked and viewed! Inspired by Victor Hugo's novel, this Disney film follows a gentle, crippled bell ringer as he faces prejudice and tries to save the city he loves. A deformed bell ringer falls for a beautiful gypsy girl and lives happily ever-after? Hey, it could happen. There is a way to watch The Hunchback of Notre Dame in the Netherlands, even though it isn't currently available on Netflix locally. What you need is a system that lets you change your Netflix country. With a few simple steps you can be watching The Hunchback of Notre Dame and thousands of other titles! Watch "The Hunchback of Notre Dame"